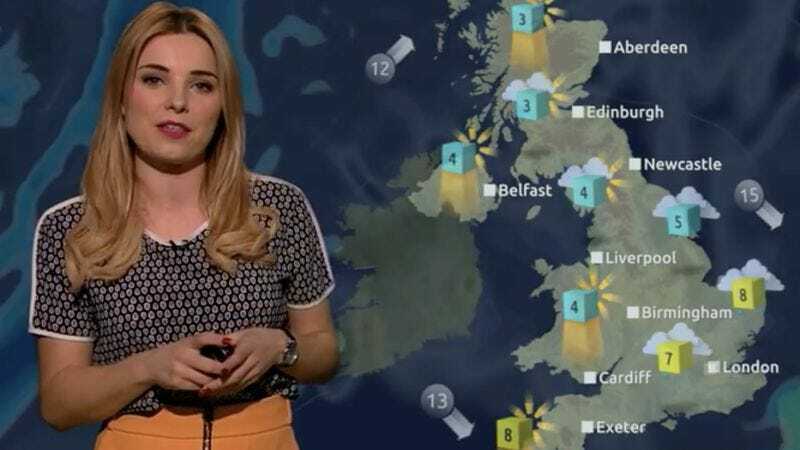 Sian Welby was hailed as a wordplay enthusiast after sprinkling a forecast with The Force Awakens-related puns last year. The video of that weather update, which saw the meteorologist telling viewers they could get “Wookiee” and miss the rain, has garnered nearly 4 million views. So Welby struck back in a recent update, but on a different front, cumulonimbly working in dozens of puns inspired by Batman V Superman: Dawn Of Justice, which is probably the only ray of sunshine that movie’s afforded anyone. To hear Welby tell it, rain will be the Bane of western England while cloudy skies will Affleck other parts of the country on this Easter weekend. Weather or not Welby’s predictions were accurate, we expect the meteorologist will dew a Marvelous job when Captain America: Civil War opens in May.